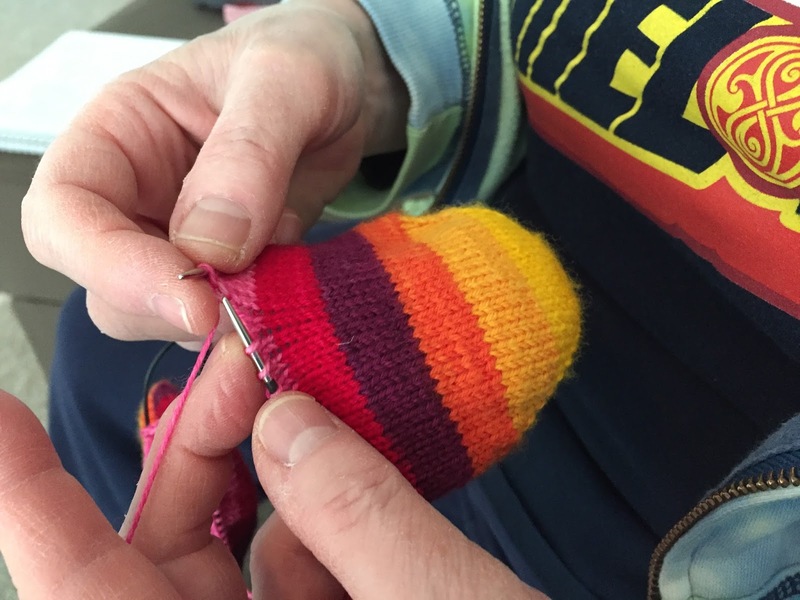 Abby is working on self striping socks from Fab Funky Fibers in the color Fifteen Color Rainbow. And she is close to finishing the Hitofude Cardigan. 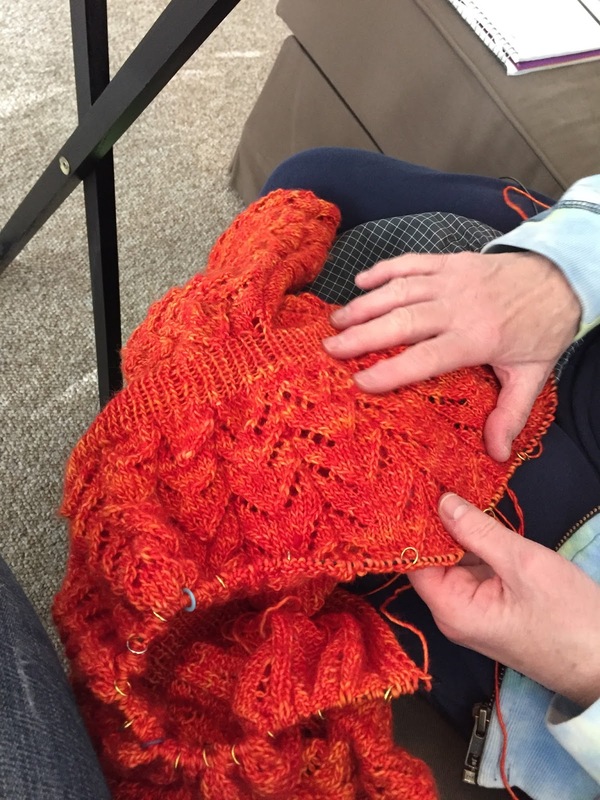 Abby is already completing a 2016 resolution by learining double knitting while working on the Null Hypothesis scarf. And she is using some beautiful wooden yarn bowls to keep the two yarns organized. 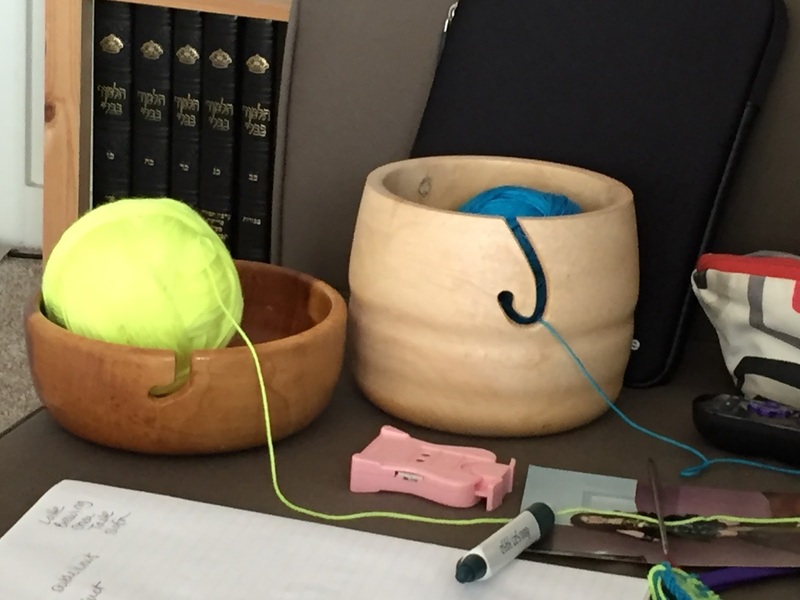 The yarn bowls were given to her from listener Kim in California. One is poplar and the other is maple. For this project, Abby is using the new madeline tosh sock yarn in Blue Nile and Edison bulb. Melissa received a knitting bag made of fabric called, “Dysfunctional Families,” and a self striping sock yarn from Yarn vs Zombies as a birthday present from Abby. Thank you Abby! Abby and Melissa discussed process vs product. Abby has been working on quilt for the last 17 years, finished it up and sent it off without taking pictures. She discussed quilting and finishing. Let us know what you think about process vs product. Abby has blocked the Ribbon Shrug by Louisa Harding which she made out of malibrigo chunky yarn. And needs to plan a costume around it. She also found the Time Traveler's Costume Guild. Melissa reviewed The Night Before Christmas in Crochet by Clement C. Moore, Mitsuki Hoshi, published by Harper Design. Abby has been listening to the Mary Russell and Sherlock Holmes Books on audio books. Listening to audio books that she has already read allows her to concentrate on her sewing projects. Abby is catching up on the Walking Dead. Melissa is watching The Knick on Cinemax. Abby checked out Flesh and Bone. We are thinking of doing a podcast or a stream of us playing a game or watching a TV Show and knitting. Let us know what you think. You can reach us at knitknitcafe@gmail.com and as Abbyknitz and MissMAB on Ravelry!